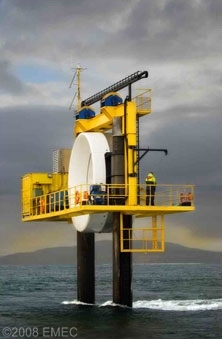 In December 2006, Irish energy technology company OpenHydro successfully completed the installation of the first tidal turbine at EMEC. The Open-Centre Turbine is the first tidal technology to reach the stage of permanent deployment in the Atlantic Ocean and represents of 10 years design and development work. It will now undergo a comprehensive test programme in fast flowing waters at the Fall of Warness, a channel off the island of Eday, where EMEC has established a new marine laboratory for tidal energy devices. “This will be the UK’s first grid connected tidal turbine – and we are now well on course to producing the first tidally-generated power for the National Grid,” said OpenHydro chief executive James Ives. OpenHydro’s aim is to deploy farms of tidal turbines under the world’s oceans, silently and invisibly generating electricity at no cost to the environment. The commercially deployed machines will be mounted on the seabed, with no part of the structure visible from the surface, and deep enough to avoid interference with shipping. In Orkney, the prototype turbine has been installed between a twin monopile structure, enabling the unit to be raised and lowered. This will allow OpenHydro to test future generations of the Open-Centre Turbine at minimal cost. OpenHydro will now begin a period of testing the turbine at EMEC, which is scheduled to last several months during 2007.